At S. W. Industrial Filter Tec Services in Saskatoon, we sell brand name parts for all of your automotive requirements, including your high performance and racing needs. Since we joined Uni-Select, we’ve been able to fit you with all the parts you need for automotive repairs and customizations, running the full gamut from bumper to bumper. Engine, steering, chassis, electrical, body panel; we’ve got you covered. In order to do a job properly, you need the proper tools. Chances are we have what you need, whether you’re looking for hand models or air tools. The worst part about working on vehicles and equipment is cleaning up shop once you’re done. Regardless, it needs to be done, so we have the heavy duty shop supplies to cut through all that oil and grease. We also have the supplies you need to clean your automotive and vehicle parts. You might know your way around vehicles and heavy equipment, but you’re not going to be able to do what you need to do without the proper shop equipment. Our Saskatoon industrial tool shop stocks the tools preferred by professionals, including big ticket items such as compressors, vehicle lifts, and diagnostic equipment. Motorists and equipment operators who know the importance of exhaust systems will find the high quality, full service they need at S. W. Industrial Filter Tec Services. With a staff that has more than 50 years of combined experience, we know our way around an exhaust system. Are you looking for exhaust elbows? We have them. It’s that simple. We have all the adapters and accessories you could possibly need. Connectors, Reducers, ID/OD, OD/OD, ID/ID, Clamps: you name it and we’ll have it on hand. We have a variety of sizes when it comes to steel and flex exhaust tubing and hose (1.5” to 6”). Our steel pipe is top-quality, with a tight-tolerance fixture. Flex tubing is made of the highest quality galvanized or stainless steel. 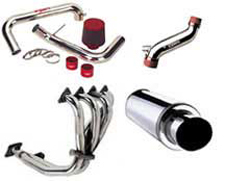 An exhaust system is a complex automotive parts assembly that performs a variety of functions. You know this. We know this. That’s why we have the parts and experience necessary to get you the parts you need to fix, customize, or even rebuild your exhaust system. If it's stock, it doesn't rock. If you’re looking for more performance from your vehicle, one of the easiest components to upgrade is the exhaust system. Your vehicle’s exhaust system expels exhaust gasses according to standards of economy, sound, durability, performance and appearance, in this same order of importance. A performance exhaust system, however, takes care of the same requirements but with your priorities in mind. You need quality air filters for maximum air flow to improve performance, but you also need an air filter to trap the dirt that can cause wear and tear on your engine. We have the air cleaners and the air cleaner parts you need to keep your vehicle or equipment running better for longer. S. W. Industrial Filter Tec Services in Saskatoon uses DURACOOL®, a trusted industry brand in all of our air conditioning products and services. DURACOOL® Refrigerants Inc. is one of the leading hydrocarbon refrigerant manufacturers and produces one of the most sought after hydrocarbon refrigerants available in today’s market. Duracool® provides consistently superior cooling capabilities and is only safe and highly efficient, but also non ozone-depleting and non global-warming. The DURACOOL® line of products is non corrosive and won't harm air conditioning components. Duracool12a® contains a Trade Marked™ synthetic friction fighter that enhances performances and safety. The DURACOOL® line of products is absolutely non-toxic - 100% natural organic product. DURACOOL 12a® is non-toxic, and totally organic. This is one of the major differences between the DURACOOL 12a® product and the R134a product, which is highly toxic. Are Duracool Products Environmentally Friendly? Yes. The DURACOOL® line of products is non-ozone depleting and non-global warming. Only hydrocarbon refrigerants can claim to achieve both of these criteria. GREENPEACE has been long singing the praises of the hydrocarbon technology, encouraging governments and industries to adopt it over the current products. From small cars to large trucks, farm equipment, and construction machinery, Swift Filtration cleans any type of filter to remove exhaust residue, dirt, and other contaminants. If you have a reusable filter, we take the filter out, clean it and the surrounding areas, inspect it for wear, and put it back in place. We also replace disposable or worn out filters so your engine of any kind runs smoothly. Our experienced mechanics can complete this service quickly while you wait so you can get back to work or get where you need to go.